The Elemental Mixology Kit, often purchased by students of Elemental Mixology, is now available for shipping within the U.S.A. through the Elemental Mixology Storefront. Expensive Limes Merely a Prelude of Worse To Come? I took the above photo in a supermarket today. There has been some amount of complaint and adaptation in bars as a result of the high cost of limes as of late. Lime trouble may just be the beginning of a larger citrus trouble — and the effects may reach so far that no one will be especially concerned with the impact on mixed drinks. 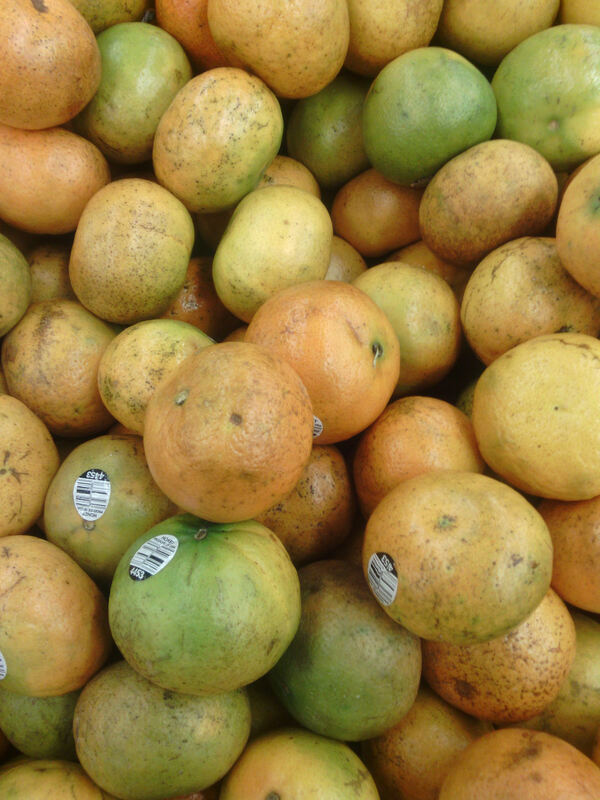 The problem is citrus greening disease, also known as huanglongbing disease. It is a fatal disease to citrus trees and is caused by a bacterium that the Asian citrus psyllid and the African citrus psyllid have spread to all citrus-producing regions, from China to India to Florida, Mexico and even California. 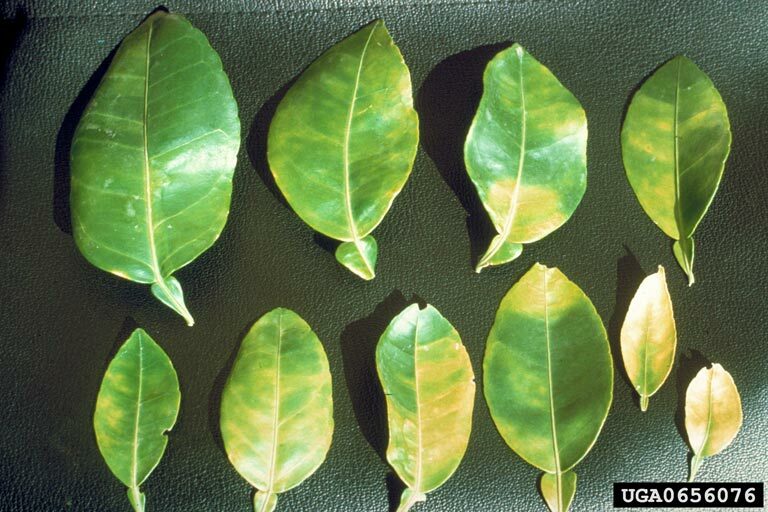 This disease is already costing the Florida citrus industry more than two billion dollars per year. The disease has been found in California, but has of yet not been so destructive here. It is, however, ravaging the citrus industry of Mexico. The disease is visible in the leaves of the tree. Also, the fruits of infected trees do not ripen properly and are unpleasantly bitter. Both of the above images are from industry-related websites that deal with citrus greening disease. I have noticed that the juice of many of the bartender’s limes (a.k.a. Key limes) that I have purchased over the past year is unusually and unpleasantly bitter. I have suspected that at least some citrus growers are still selling limes from infected trees, since limes are used unripe and the disease is not easily visible in the fruit while still green. 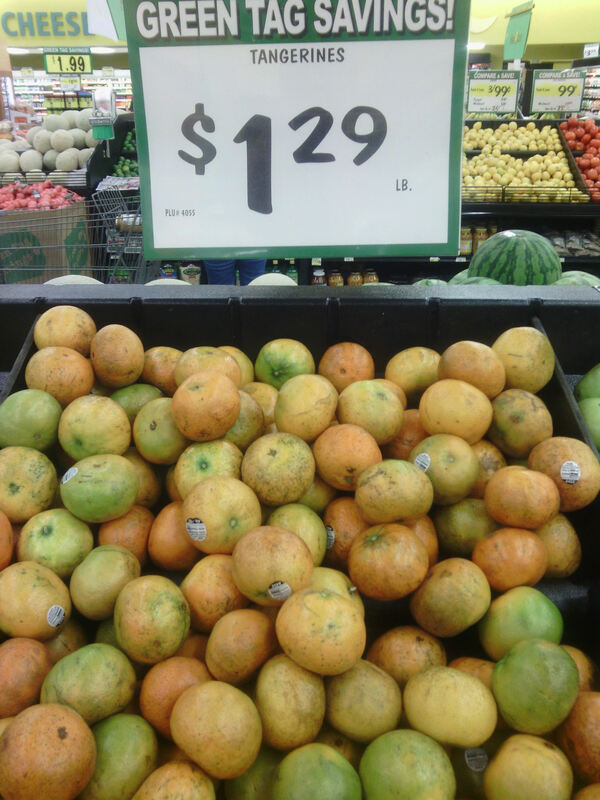 But, I was completely shocked to see a bin of mal-ripened tangerines for sale today. To me, these fruits in this photo I took today are clearly from infected trees. If the disease has progressed to the point that infected fruit is being boldly sold in supermarkets, there is real reason to fear the potential that citrus of the quality that we have learned to expect may become a rare and expensive thing. This disease could become a much bigger problem than just how to make Margaritas without good, cheap limes. Imagine a near future in which every bar has to choose between only vinegaric shrubb or artificial sour mix for the sour element in all drinks, including the Whiskey Sour, Last Word, Sidecar, Pegu Club, Mojito, Tom Collins, and every other drink that uses citrus — obviously a huge percentage of mixed drinks. Imagine no more orange juice, Cointreau, Grand Marnier, orange chicken or orange bitters… Imagine no more twists of lemon. Let’s hope someone figures out how to beat huanglongbing sooner rather than later. 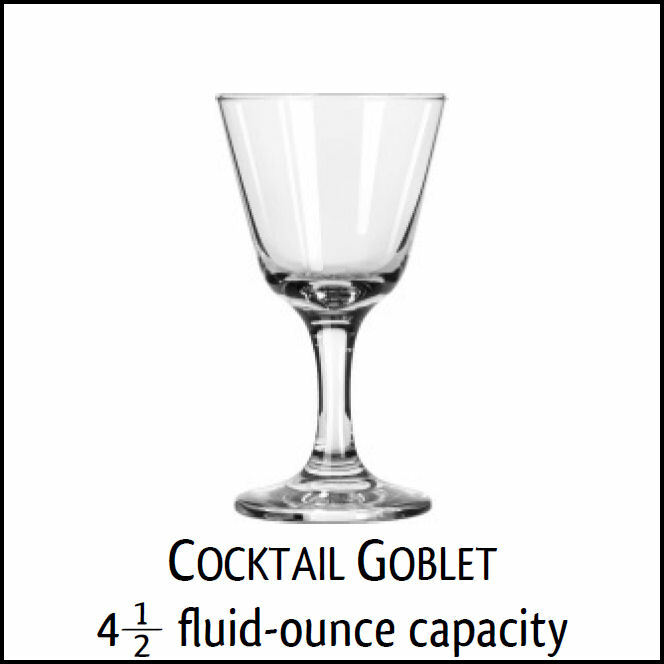 If you are in Los Angeles and looking for glassware that you can purchase individually and pick up at the Elemental Mixology location, check out the glassware section of the Elemental Mixology storefront. A couple of annual Cushion Subscriptions will be available this year, starting in Summer. A Cushion Subscription entitles the subscriber to attend all courses (except the shorter Symposium and Brief courses) for a full year. As I prepared for a course session this past weekend, I was listening to KCRW. As the Good Eats program came on, I thought, “I’m going to change the station because something in this show always irritates me.” But, I decided to give it a chance. Then I heard a certain someone being introduced as a “cocktail chef.” Puke. He used the lime shortage as a threadbare pretext to launch into an oversimplified, somewhat mistaken, mostly-folkloric exposition of his alleged knowledge of history the Sazerac Cocktail. Groan. He also suggested using grapefruit as the sour element in drinks in absence of limes. Shock. I know that it is common for small children to confuse sour and bitter flavors. But, traditionally, grapefruits were sweet and bitter. Modern grapefruits tend to be just sweet. Either way, there is less acid (and sour flavor) in a grapefruit than in an orange. Sigh. What can be expected from anyone that would have himself introduced as a ‘cocktail chef.’ I think that ‘bar creature’ would have been more appropriate.